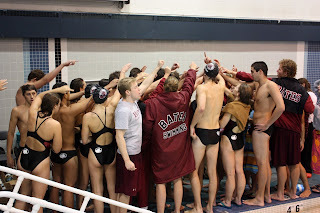 The Bobcat Chronicle: Medley Relay Videos! Below are the Medley Relays from the Trinity/Wesleyan Double Dual meet. Bates is in Lane 6-3 with garnet colored caps. Winning Relays are in Lane 6 - third lane down from the top. Men's winning relay consists of Nate Depew (26.4) , Alex McKeown (27.9), Ned Scott (23.1), and Dan Aupi (21.8). Lookin' good. Thanks for posting those. You guys Rock! Great Start!